Human resources related topics such as increasing labor costs or finding and retaining qualified staff are among the top business challenges for German companies in China. The HR Forum which took place in Beijing provided a platform for 30 participants to take a look at HR issues from different angles, including the perspective of the parent company in the home country. Mr. Kai Mütze, Managing Director, IAC Unternehmensberatung GmbH addressed the question of how to better manage international assignments, allowing a smooth transition and rewarding development for employees sent abroad as well as their parent companies. 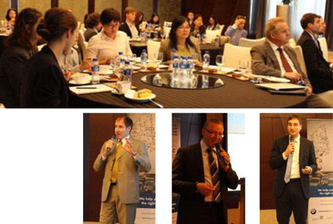 Dr. Oliver Prüfer, Head of Human Resources, Recruitment & Training, German Industry & Commerce Greater China gave insights into recruitment and specific challenges in a Sino-German environment. Dr. Nils Seibert, Head of Legal & Investment, German Industry & Commerce Greater China highlighted a range of issues to be taken into account when dealing with Chinese Labor Law. Our executive search experts in Beijing took part in the HR forum to learn more about the recent challenges related to recruitment and labor law in China.